The accent chair and a half features a mix of traditional and contemporary styling that combine to make a transitional, cottage like design suitable for most any home. The chair and a half is also available with as a sleeper. Available in numerous fabrics. The Westney Upholstered Chair and a Half by Best Home Furnishings at Best Home Furnishings in the St. Louis, Chesterfield, St. Charles, MO & Waterloo, Belleville, Edwardsville, IL area. Product availability may vary. Contact us for the most current availability on this product. Casually Sophisticated. The Westney collection embodies comfort without compromising style. Mission style slats, clean lines, and gentle arcs define the pieces. Each wood frame is finished in a distressed Pecan giving each furnishing a rustic look. Custom upholstery accompanies every piece, allowing you to design a chair to match existing furniture or to design a room around. Either way, the Westney collection will fit well with nearly any home. The Westney collection is a great option if you are looking for Mission furniture in the St. Louis, Chesterfield, St. Charles, MO & Waterloo, Belleville, Edwardsville, IL area. 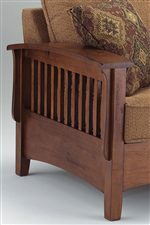 Browse other items in the Westney collection from Best Home Furnishings in the St. Louis, Chesterfield, St. Charles, MO & Waterloo, Belleville, Edwardsville, IL area.